Turn on all of the faucets in the home to check for leaks or drips. Check underneath the sinks and around seals to make sure there is no water leaking or standing. Flush the toilet in each bathroom to make sure they empty and refill correctly. Make sure there is no water leaking around the seal. Ensure the toilet shuts off correctly after refilling. Turn on the showers in all bathrooms to check water pressure and water temperature. Pay close attention to the shower farthest from the home’s water source. If the farthest shower has a decrease in water pressure or temperature, this may signal a problem. Locate the water meter and main water shut-off valve.Knowing where the main water shut-off valve is essential if you ever encounter a plumbing leak. When the water is shut off there should be no water coming from any of the taps in the house. Understand the type of sewage system your home is connected to.Knowing whether you are connected to a municipal water system or a septic tank, as well as the ins and outs of using either, will be important if you should run into a plumbing problem. If you are connected to a septic tank you will want to do a further inspection to make sure the septic tank is installed properly and does not have any leaks or cracks. Inspect the home’s hot water heater.Make sure the hot water heater is in working order with no leaks and that it is appropriately sized for your family’s use and needs. 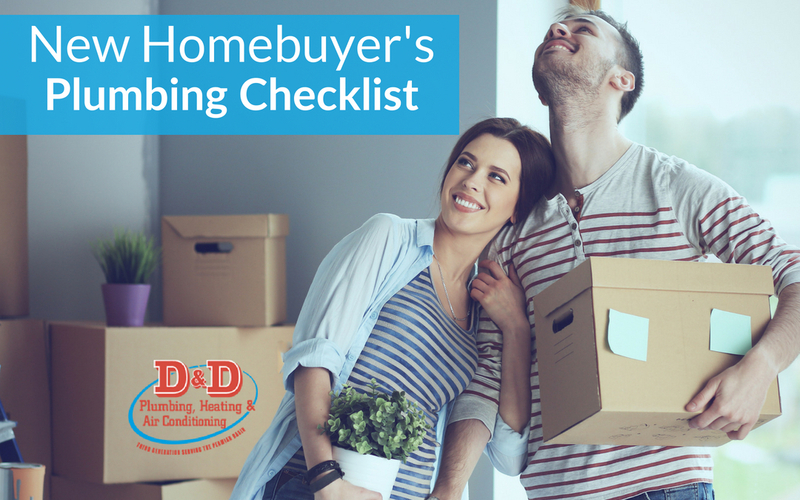 Taking the time to inspect your home and take care of plumbing issues before you move in will save you time and money down the road. If you need quality, professional plumbing repair contact D&D Plumbing, Heating, and Air Conditioning.